Cardio is essential for keeping your heart strong. Plus, it can give your energy levels a boost and keep your metabolism revved all day long. 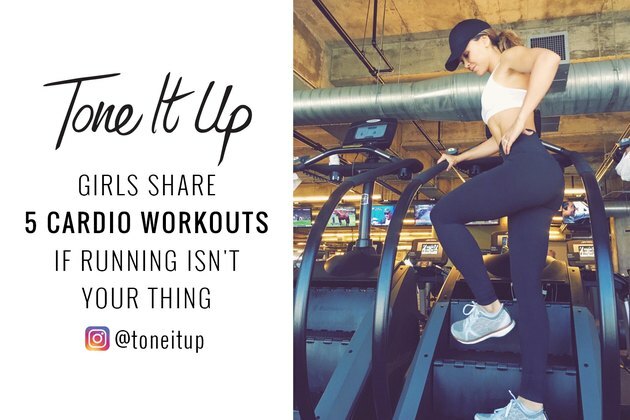 At Tone It Up, we like to get in some form of cardio four to six days a week. We love the treadmill, but it’s also fun to switch it up. Changing your cardio routine keeps you from getting bored and increases the chances you'll actually stick with your workout plan. Check out our favorite ways to get a cardio workout without setting a foot on the treadmill. Biking is an amazing way to enjoy the great outdoors while burning major calories and toning your lower body. Switching up your usual walk or run helps to build total fitness and can help promote weight loss. Simply hop on a bike alongside a friend and head to a coffee shop or park. Aim for a 20- to 40-minute ride. Sculpt every inch of your body with this jump rope routine. It’s a killer cardio workout that tones your core and builds stamina. You can even jump rope between body-weight exercises to keep your heart rate high. We always bring a jump rope when we’re traveling so that we can do our cardio workouts wherever we are. High-intensity interval training, or HIIT, is our go-to workout when we need energy all day long. It combines short bursts of activity with total-body toning, which helps you to burn calories long after your workout is over. Try our Sandy Sweat HIIT routine for the perfect beach workout. Step up your cardio with a stair workout. Stair routines are one of our favorite booty-toning and cardio workouts because they sculpt your entire lower body and raise your heart rate. You can sweat it out in the gym or take this routine outdoors. Kickboxing is an extremely effective cardio workout that also makes you feel like a total badass. With short rest periods and high bursts of energy, you’ll engage your entire body and torch calories. You’ll get some extra core toning too, which helps to improve posture, digestion and breathing. Try this kickboxing routine to sculpt lean muscle and fire up your metabolism. Whatever cardio workout you choose, make sure to refuel afterward with quality foods. We always have a smoothie with our clean, non-GMO Tone It Up Protein. Try one of these delicious recipes for a perfect post-cardio snack. What’s your favorite cardio workout? How do you refuel after a cardio session? Share in the comments section!